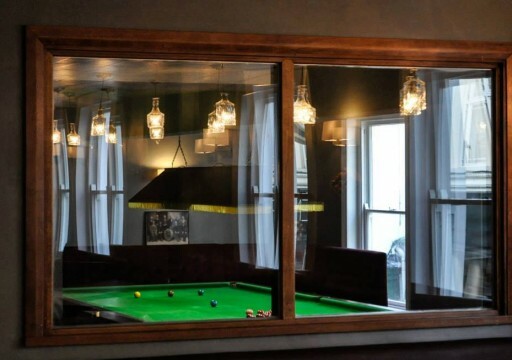 The Games Room is a contemporary take on an old school pool and snooker bar. 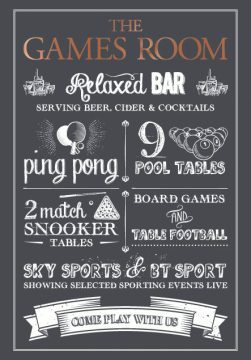 With 9 pool tables, 2 match snooker tables, 2 table tennis tables, air hockey, darts, table football and a host of other table top games you won’t be bored here! Competitively priced drinks certainly help to create a great atmosphere and friendly staff help make this bar a big hit.This is a place where real ales, local ciders and cocktails are taken very seriously. Add to this a drop down screen for selective Sky Sports games and you have a great bar with a lively atmosphere whether you want a quiet pint or an evening of serious pool playing.Come play with us!